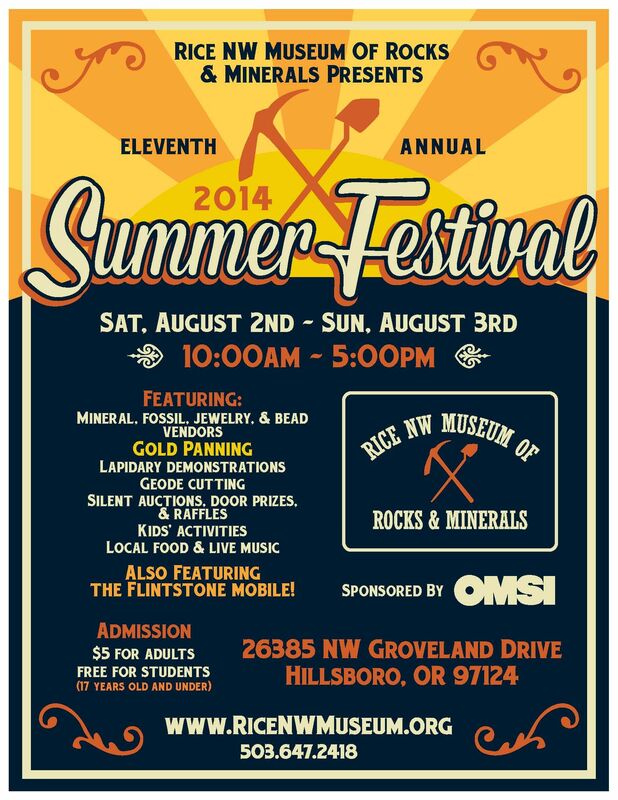 Join us for the 11th Annual 2014 Summer Festival on Saturday and Sunday, August 2-3, 2014, 10AM to 5PM, at the Rice Northwest Museum of Rocks and Minerals. Sponsored by OMSI, the weekend event includes vendors with minerals, fossils, jewelry, and beads, gold panning, lapidary demonstrations, geode cutting, and a variety of activities for the young and old. There will be local food available for purchase and live music, and the famous Flintstones Mobile will make an appearance. A silent auction, raffles, and door prizes will be held throughout the day. Admission is $5 for adults, free for students 17 years old and under. A great experience for the whole family! Bring your inner rock hound and join us for a fabulous Summer Festival. Belong to a local school or rock club? Download and print and share the flyer for the 2014 Summer Festival Event. To honor the 11th Annual Summer Festival, we are having a membership campaign. All attendees are eligible for $10 off all annual membership plans. The $5 admission fee will be applied toward membership, totally $15 off!